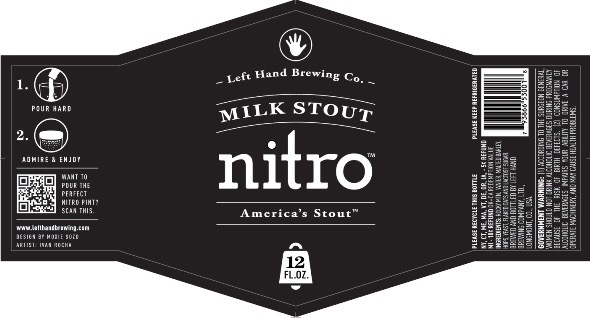 I tried this from the nitro bottle at Salt in Boulder, Colorado and it was perfectly poured with a tall, foamy head. Salt is a fantastic farm-to-table restaurant on Pearl Street with dangerously tasty food and a good selection of local brews and other craft beer. If you’re not familiar with the nitro pour, nitrogenation produces tiny bubbles that give the beer a fluffier, creamy consistency. Oftentimes it also enhances the aroma and mutes sharper flavours like hop bitterness. The differences between the same beer poured with CO2 vs N2 gas can be vast and I almost always favour the latter but it’s definitely worth trying them side by side if you have the chance. It’s somewhat rare to find bottled nitrogenated beers so I was excited to try this one. It’s full fluffiness is achieved through a hard pour that involves holding the bottle perfectly vertical. This milk stout pours dark, dark brown but not entirely opaque when the light hits it. Its malt profile is listed as pale two-row, Munich, Crystal, roasted barley, flaked oats, flaked barley, and chocolate. This produces as big toasty flavor with espresso and chocolate flavors but it’s very smooth with not a hint of bitterness or alcohol bite. American hops take the back seat. The classic lactose flavor plays weII with a strong vanilla character and aroma. As expected it has noticeable but not overwhelming malt sweetness and a milky consistency. Any fruity esters are very mild and kindly defer to the mocha malt profile. I loved the complex peaty flavors from the roasted malts but again this brew was silly smooth. This is another beer I would recommend to people who love coffee but typically aren’t so keen on beer. It would also pair beautifully with a chocolatey dessert or a few scoops of ice cream.